AWESOME WATERFRONT!!! BOOK YOUR SUMMER VACATION NOW!! Looking for a place to relax in a quiet private setting in Northern Michigan? This beautifully decorated and accessorized 3 bedroom home is the place for you!!! Fully stocked kitchen with all the amenities you can imagine! Sliders to huge deck with lots of comfortable furniture & gas grill. Large open living area & bedrooms, full walkout basement with second full bath & laundry area. Set in a secluded, wooded area with a large dock to relax on! Includes a paddleboat & aluminum fishing boat. A pontoon is available on nearby Big Bass lake, a 300 acre all-sports lake for rent if you like to explore the area. 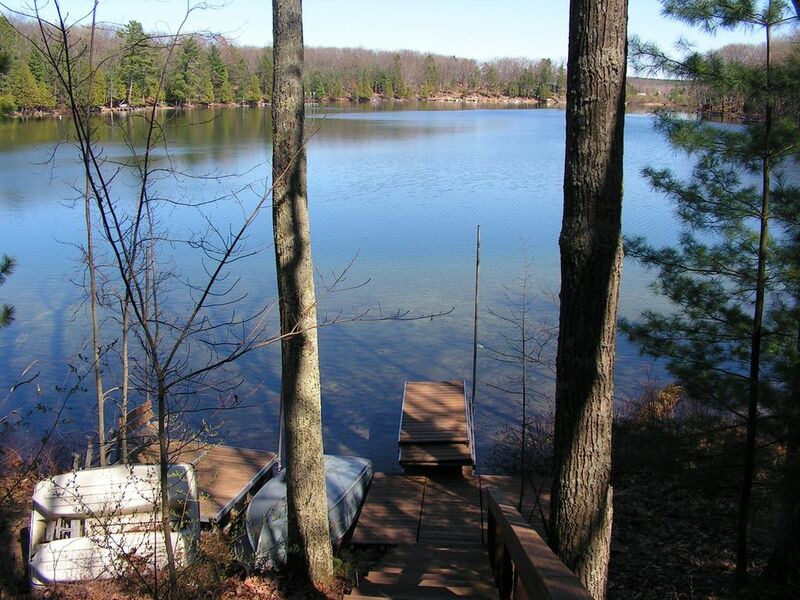 Located on Sauble Lake #1 (on a chain of 4 lakes,all accessable with the fishing boat or paddleboat). Or out the backdoor is excellent fishing for bass, blue gill, perch and pike with small boat access to Sauble #2, 3 and 4. Dublin Grocery store less than 12 miles away (famous for their jerky & fudge, with full hardware & grocery). Just around the corner is the Natahka Corner store (convenience store & gas station), plus dining at Natahka tavern and Blossoms Cafe Or visit Irons Cafe and Jacki's Place located in the town of Irons approximately 8 miles away. North country hiking trail access just 5 miles from cottage for mountain biking or hiking. ORV trails and trailhead located on M37. See calendar for availability and send email inquiry or call (231) 266-5720. Why the Owner Chose Irons: Our home is located on a beautiful chain of lakes in the heart of Lake County, known for it's abundance of lakes, streams & hiking/snowmobiling trails. This home is surrouded by trees and very secluded. Laid back lifestyle with little traffic but loads of interesting places to visit nearby. Quiet & secluded, our home is a unique experience in the woods of Northern MI!! Come relax & enjoy 'mother nature' at her finest! Fish, hike, hunt or just relax and watch deer & wild turkeys in your front yard! No traffic or abundance of tourists to disturb your vacation - enjoy the true beauty of 'up north' solidtude!! Surrounded by woods yet within 30 minutes to Lake Mi. beaches, shopping, restaurants & a multitude of N. MI attractions. View more about Rose Smith, Mgr. Main floor bath has a separate sink area available when main bath area is being used. Fully stocked for cooking & entertaining. Large fully stocked kitchen open to living/dining area. Large deck overlooking lake with two tables & chairs, plus add'l padded chairs/benches. Absolutely loved this cottage, lake & property. Lovely cottage on a beautiful lake in a private setting. Fishing was good...6+ nice sized bass caught this week. The family thoroughly enjoyed this week & are looking forward to returning next summer. Was very cozy and relaxing. Staying on the lake was great Lots to do around the area. Cabin was very clean and friendly. Rose take great care to see that her guests are comfortable and feel like they are home...away from home. Thanks again!!! This was our 2nd year at the lake house, and it was just as wonderful as the first. The private lake is incredibly quiet and so very peaceful. This location offers everything our family could want. Our dogs enjoyed exploring and swimming each day. We're planning to return again. Little details make the whole (good :-)) difference! Visited the cottage for the 2017 Labor Day weekend. It's a bit far from where we live, BUT everything else is perfect: the location, the silence but the nature good relaxing noises, the coffee on the dock every morning, the stillness of the lake, the fact that there are no motor watercrafts allowed, the nice cabin interior and all the kitchen needs... I was pleasantly surprised that we found salt and pepper there, but most of all (:-)) that we found mashed potatoes masher(! ), and the good quality silicone spatula- as I said: little details... that made the whole difference! I hope all will be kept at the same high standards for our next trips! Me and my family had a wonderful time vising this area of MI. We were surprised at how far off the beaten path our lake house was located while driving to it. Once we arrived we didn't want to leave! The local business owners were helpful and always pleasant. Very convenient stay and we will be returning again. Only 45 minutes from the Western MI coastline which was a nice side trip. Thank you so much. Richard Smith and Family. Relaxing, peaceful, and just perfect!!! The cottage on Sauble Lake was just what our family was hoping for, and more! We were greeted by a vase of fresh wildflowers and a chilled bottle of wine. The cottage is back from the road and so very quiet. We saw deer and partridge in the yard almost daily. The house was comfortable and spacious for 5 people and 2 dogs. Kitchen was stocked with all the dishes and pans we needed. We loved the fire pit by the water. We fished daily off the dock and around the lake using the paddle boat. We caught many blue gills and bass. Our dogs loved the beach area and being able to swim daily. We brought our own kayaks and were able to kayak to all 4 of the connected Sauble Lakes. That's a fun adventure! We knew the first day we arrived that this cottage was perfect for our family and we would be back again. Can't wait to plan next summer's trip! Thank you, Rose, for always answering my questions so promptly and providing us with a wonderful vacation! Ludington and Manistee beaches approximately 30 miles west, restaurants and festivals are fantastic summer tourist attractions as well as Irons Ox Market & Flea Roast, Baldwin Troutarama, Irons Cowboy Weekend and Blessing of the Bikes (see IATA Web Site for details). Check in time Saturday at 4:00PM, Check out - Saturday at 11:00AM. Renting for full weeks only for the months of June, July & August. Weekly rate is for up to 6 guests. Add'l fee of $5/night for extra guests.To reserve dates please send an Email or call to request a contract to be sent via Email.